Financial Times has released its 2017 Global MBA Ranking of the best 100 programs. 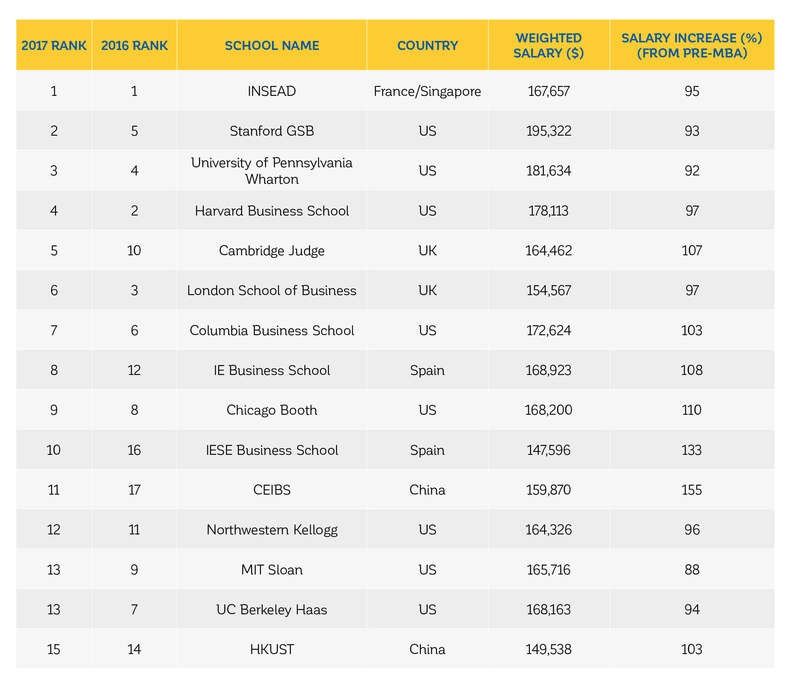 These rankings are based on surveys of business schools and their graduates of 2013. MBAs are evaluated according to alumni career progression, the school’s idea generation, and the diversity of students and faculty. • INSEAD, a multi-campus international business school, has taken the top ranking for the second year in a row. Stanford GSB is in second place, up from fifth last year. Wharton is in third place. Cambridge Judge jumps five places to fifth. This is the first time that London Business School is not the top-ranked UK school. • Three top schools – Harvard Business School, London Business School, and MIT Sloan – fell in the rankings. Harvard fell two places to fourth. This is the first time in nine years that Harvard has been out of the top three. LBS dropped three places to sixth, which is its lowest rank in 14 years. MIT falls to 13th place, which is the first time in 10 years that it’s been outside the top 10. • This year there are 51 US schools in the ranking, up from 47 in 2016. • Canadian schools persist in losing ground. There are only three in this year’s ranking, down from five last year. All of the Canadian schools fell about six places. • Australian and Spanish schools are doing well. Each country has three schools in the ranking, and all have risen. • The top 15 MBA programs are similar in terms of income, career progress, and satisfaction. Stanford’s alumni earn an average of $195,000. All but one of the top 15 have average alumni salaries of more than $150,000, with a pay increase of about 100% compared to their pre-MBA income. • Top employment sectors for grads of the top 15 schools are Finance/Banking, Consultancy, IT/Telecom, and E-commerce. You can read the full story at FT Global MBA Ranking 2017: Analysis. Last updated on November 30, 2017.